A Vote to Maintain Apartheid? Israel’s Netanyahu Set to Win 5th Term After Vow to Annex West Bank | Democracy Now! Israeli journalist, activist and union organizer. He is the executive director of 972 – Advancement of Citizen Journalism, the nonprofit that publishes +972 Magazine. Matar is a conscientious objector who refused to serve in the Israeli army. Palestinian attorney. She has served as a legal adviser to the Palestinians in negotiations with Israel. She was previously an adviser to Palestinian President Mahmoud Abbas. "Likud attempts to intimidate Palestinian voters with hidden ballot cams"
PRIME MINISTER BENJAMIN NETANYAHU: [translated] It is a night of colossal victory. Colossal. I am very moved that the people of Israel put their trust in me again, for the fifth time—a greater trust, even. I intend to quickly finish the work in order to form a national stable government. AMY GOODMAN: We’re joined now by two guests. 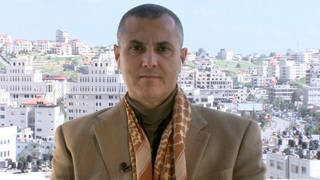 Haggai Matar is an Israeli journalist, activist and union organizer. He’s the executive director of 972–Advancement of Citizen Journalism, the nonprofit that publishes +972 Magazine. He joins us from Tel Aviv. And in the Israeli city of Haifa, we’re joined by Palestinian attorney Diana Buttu. She was a—she is a former adviser to Palestinian President Mahmoud Abbas and has served as a legal adviser to the Palestinians in negotiations with Israel. She’s a Palestinian citizen of Israel. HAGGAI MATAR: Definitely. So, we can also add to that the moving of the American Embassy to Jerusalem last year. It seems like a long time ago, but I think it’s all very relevant, because what all these measures are doing and saying is that there’s an old kind of balance that we used to talk about in Israeli politics, wherein Israel, the one thing—the two things that Israel can get from moving towards peace, moving toward ending the occupation, are, one, safety and security, and, two, international recognition and legitimacy, for all sorts of things that Israel wants. Basically what—sorry—Trump has been doing to support Netanyahu is offering sorts of legitimacy to Israel without any conditions—so, moving the embassy to Jerusalem without conditioning a partition of the city; recognizing the annexation of the Golan Heights, basically giving up on any sort of negotiations, in this case with the Syrians; basically, giving Netanyahu a green light to annex part of the West Bank, as well, because you don’t need Palestinians to agree to this, because, there you go, you have international legitimacy even without any negotiations. DIANA BUTTU: In terms of the reaction vis-à-vis the outcome that we’ve seen, this was, in effect—for Palestinians at least, this was an election in which you either choose Trump or you choose Trump. The positions that both Likud took and Benny Gantz took were virtually indistinguishable, particularly when it came to Palestinians. They bragged about how much they were going to beat up on Palestinians, and then took their voters as a result. So, it’s not at all surprising that we see this outcome, given that we really had two candidates that were quite mirroring one another when it came to this election. The big problem, however, is that we’ve seen a rise in fascism in Israel, and instead of people boycotting, we were hoping to see that people would have come out in greater numbers to try to at least push back against that tide. As it stands right now, although the vote—the ballots have not been completely counted, we really only have about 15 out of 120 members of Knesset who believe in equality and who believe in an end to the occupation. And that’s a very sad indication of where Israel is. AMY GOODMAN: Diana Buttu, can you explain who can vote in the Israeli elections and who can’t? And also respond to these 1,200 cameras being put in the election booths, the polling places of—in Arab neighborhoods. AMY GOODMAN: “Take a Stand” by Stephan Said. And a shoutout to the students from Guttman Community College who are visiting Democracy Now! today, watching the live broadcast. This is Democracy Now! I’m Amy Goodman, with Juan González. Our guests, Palestinian attorney Diana Buttu, joining us from Haifa, and Haggai Matar, an Israeli journalist, activist and union organizer, with the 972. He is joining us from Tel Aviv. JUAN GONZÁLEZ: I wanted to ask Haggai Matar, given the reality that it looks likely that Netanyahu will be able to set up a governing coalition, what about the corruption—the multiple corruption investigations circling around him and the possibility of how that may affect his ability to govern? Could you talk about that? HAGGAI MATAR: Sure. That’s actually one of—that’s actually the main question facing Netanyahu right now, because he will be forming a new coalition government. The question that Israelis are talking about today is: Will he be able to form what is called an indictment coalition? An indictment coalition means a coalition that would support Netanyahu through an indictment and actually pass legislation that would either prevent presenting criminal charges against a sitting prime minister or allow him to continue ruling while facing charges. So, that is the main challenge for Netanyahu right now. If he fails to do that, he probably has less than one year before he actually has to face criminal charges and go to trial, and probably step down. But that’s the main question we’re looking at. If he does have to step down, we have already heard certain indications from the centrist party that came in at the same level as Likud party, the Gantz party, basically saying that they would be willing to go into national unity without Netanyahu, kind of implying that they would be willing to cooperate with Likud if Netanyahu steps down. So that’s something that might happen, but we might also be looking at another general elections within a year. JUAN GONZÁLEZ: And unlike the United States, a sitting national leader can be brought to trial? HAGGAI MATAR: Yes, he can. Meanwhile, a member of parliament seeking re-election came under fire over a campaign advertisement depicting him shooting and killing a Palestinian colleague. In the ad, Oren Hazan, a lawmaker with the ruling Likud party who represents a Jewish-only West Bank settlement, is depicted as a character in the Clint Eastwood film The Good, the Bad and the Ugly. Hazan’s face is superimposed over a character who shoots and kills Jamal Zahalka, a Palestinian citizen of Israel and member of Israel’s parliament, the Knesset. Zahalka has called for police to arrest Hazan over the ad. Haggai, if you could respond first? And then we’ll get Diana Buttu. HAGGAI MATAR: Yes. Well, I think, for most of the ads you mentioned, the common thread that we see there—and this, unfortunately, has been a repeating thread, theme in Israeli politics—is basically an inner-Jewish discussion about: How do we treat Palestinians? That’s kind of the question to be decided. How much force do we use against Palestinians to keep them down? Because we’re not going to give up on the occupation. We’re not going to give up on the siege. So, just how much violence are we willing to use to maintain the status quo? With Ayelet Shaked, we see basically a statement that, “Yes, I’m happy to curtail the power of the judiciary. I want the government to rule without the checks and balances of the courts. That’s something that I want. And I call it democracy. Do you agree?” Luckily, by the way, they probably—her party is probably not going to make it into the new Knesset. JUAN GONZÁLEZ: And, Diana Buttu, I wanted to ask you, there’s a lot of attention focused on—internationally, on what happens with Palestinians in Gaza or the West Bank, very little about the Palestinian citizens of Israel. Could you talk, especially in the light of this increasing fascist tendencies within Israel, about what life is like for Palestinian citizens of Israel? DIANA BUTTU: Yes, definitely. One of the things that we saw in this last parliamentary session, the last Knesset, was that a lot of the attention, a lot of the focus, was directed directly at Palestinian citizens of Israel—while bombing Gaza, at the same time trying to go after Palestinian citizens of Israel. So, one thing that this Knesset did was they passed the—what they call the Jewish nation-state law, which is actually a law that enshrines Jewish supremacy and that formalizes apartheid. This is something that they did in order to send a message to Palestinians in Israel that they are not equals and they will not be equals. And, in fact, Netanyahu made—during the election campaign, made it clear, when he said that Israel is the nation-state for the Jewish people only. And so, this level of incitement against Palestinians in Israel, whether it’s against the Palestinians who are members of Knesset or in a day-to-day life, has been one in which we’re increasingly seeing more and more laws that are designed to discriminate directly against Palestinians, with less and less restrictions being placed on the government. In fact, we now see that the Israeli High Court, the equivalent of the Supreme Court in the United States, has rubber-stamped virtually all of these racist laws and allowed it so that Israel is able to continue its apartheid practices. In effect, what it means for Palestinians is not only are we second-class citizens, but we are actually treated as a fifth column, with some members of Knesset, including one who has made it past the threshold and who will be once again elected in, former Foreign Minister Avigdor Lieberman, who once called for the beheading of Palestinian citizens of Israel and, during this election campaign, called for the instatement of the death penalty for Palestinians who are political prisoners. This is the flavor that we’re living in. It is fascism. AMY GOODMAN: I want to turn to the reaction on the streets of Bethlehem to hear how some Palestinians are reacting to the election results. WAJEH AWAD: [translated] It’s natural. The Zionist regime is an occupier, an aggressive regime. Netanyahu or any other person will not make change for us as Palestinian people. The result, if it was right-wing parties or left-wing parties, they have the same mission against us, which is killing and displacement. MUATH ABU AKAR: [translated] It was obvious from the beginning. Netanyahu’s campaign was strong because it was about the Palestinians’ blood, the settlement expanding and the sanctions on the Palestinians. It was obvious. AMY GOODMAN: Those are residents of Bethlehem. Tuesday’s election came just days after Prime Minister Netanyahu vowed to annex Israeli settlements in the occupied West Bank in defiance of international law. Let’s turn to Secretary of State Mike Pompeo, who was asked about U.S. policy on the West Bank as polls were closing in Israel Tuesday. He was questioned by Democratic Senator Chris Van Hollen of Maryland. SEN. CHRIS VAN HOLLEN: Is it still the policy of the United States to oppose Israel’s unilateral annexation of any or all of the West Bank? SECRETARY OF STATE MIKE POMPEO: Yeah. SEN. CHRIS VAN HOLLEN: It sounds like you’ve already abandoned what has been a bipartisan foreign policy of opposing the annexation of any or part of the West Bank by Israel. Is that what you’re telling us today? SECRETARY OF STATE MIKE POMPEO: I think we—I think we’ve seen—I think it was Senator Durbin that critiqued our decision on the Golan, where he would characterize that, right? SEN. CHRIS VAN HOLLEN: —right now. SECRETARY OF STATE MIKE POMPEO: Right. SEN. CHRIS VAN HOLLEN: I’m asking you about the West Bank. SECRETARY OF STATE MIKE POMPEO: Yeah. And I’m telling you, you will see our proposal when we’re ready to roll it out. SEN. CHRIS VAN HOLLEN: The polls are—the polls are closing right now—right now—in Israel. And things could move very quickly. And as you know, the prime minister, as a candidate, said he would annex all or part of the West Bank. He said settlements, and then he said including outposts. And today you cannot tell us what U.S. policy is on this issue. SECRETARY OF STATE MIKE POMPEO: Yeah, again, I think I’ve answered the question as I’m going to answer the question. AMY GOODMAN: That was Secretary of State Mike Pompeo being questioned by Democratic Senator Chris Van Hollen of Maryland yesterday. Diana Buttu in Haifa, if you can respond to what he was asking? And also, just talk about the threat to annex the settlements in the West Bank and the occupied Golan Heights. DIANA BUTTU: Yes. You know, this is the part that’s the most alarming. One of the fundamental, basic principles of international law is that you can’t acquire territory by force. You can’t steal another country’s land or another people’s land. And what the Israelis have been doing for decades, and what now the Trump administration is giving a green light to, is that very principle of turning international law on its head and allowing states to actually take more and more land. And what it’s doing is it’s sending the message, not just in the Palestinian context, but around the world, that might is right and that it doesn’t matter what international law is, it doesn’t matter what international legal order is. What matters is how strong you are. And the more that you exert your force, exert your power, the more land you take, in the end, you will be given a green light to do so, and you will be rewarded for doing so. And this is what was particularly troublesome about this election, was that, going back to some of the ads, this wasn’t a referendum or even a questioning about whether Israel is interested in peace and what it wants to do vis-à-vis the Palestinians in terms of whether there should be Palestinian freedom or equality. Instead, it was a question of how much they can beat up on Palestinians, how much more Palestinian land they can take, and whether they can be rewarded for it. And as Netanyahu was doing throughout the entire election campaign, he kept pointing to President Trump and saying that “Here is my friend. Here is the man who has given us everything that we want.” And in effect, he’s right. Trump has given him every single thing that he wants. JUAN GONZÁLEZ: And, Haggai Matar, what about this exchange with Pompeo yesterday? And also, to what degree, as you’ve been following closely over the years, are most Israelis now supportive of the whole idea of annexing the West Bank? HAGGAI MATAR: I think that, if asked, most Israelis would still oppose a full-on annexation of the entire West Bank, especially assuming that such annexation of the entire West Bank, including the main Palestinian cities now in Area A and B, would mean giving those Palestinians citizenship. That kind of a vision of a one-state solution, where this is one state and everybody has citizenship, is something that most Israelis will definitely object to. AMY GOODMAN: Finally, I wanted to ask Diana Buttu. There is now a hunger strike that’s begun in jails by Palestinians who are imprisoned. You have the U.N. report that’s come out saying that what’s happened in Gaza, the Israeli military response to the Right of Return marches that have been going on for a year, where well over 200 Palestinians have been killed—it looks something like 20,000 people, at least, have been injured, thousands of them shot by Israeli military. What does this all mean, the Israeli election, for this? And this is the part that is so very troublesome, Amy, is that when you look at the number of Palestinians who have been injured in direct fire by the Israeli army in the Gaza Strip, we’re talking about more people who were injured in the year of 2018, through these Great Return marches, than were injured during the entire bombing campaign, the nearly 60-day bombing campaign, in 2014. What Israel has done, effectively, is that it’s managed to fend off any international criticism. And I’m hoping, now that we are seeing that this government is going to take shape with people who are very openly supporting not only annexation, but war crimes, that we will see a stronger international response. But at this point I’m not holding my breath, because we’ve seen this now for more than 50 years. AMY GOODMAN: —served as legal adviser to the Palestinians in negotiations with Israel, previously adviser to Palestinian President Mahmoud Abbas. And Haggai Matar, Israeli journalist, activist and union organizer, executive director of 972–Advancement of Citizen Journalism, the nonprofit that publishes +972 Magazine. When we come back, Henry Reichman joins us, about his new book, The Future of Academic Freedom. Stay with us.